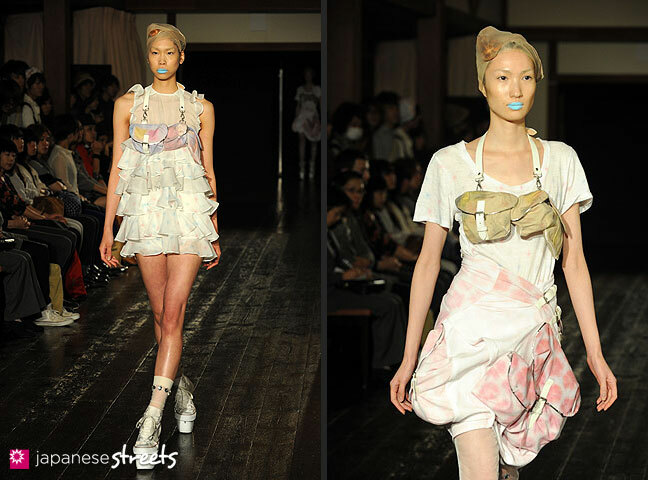 Spring/Summer 2011 Collection of Japanese fashion brand NOZOMI ISHIGURO on October 18, 2010, during the Japan Fashion Week in Tokyo. Girl/boy or boy/girl look. Very creative. Wearing a complete outfit would certainly call attention to one, but something here or there to combine with other ‘quiet’ clothes would look good. All these models I’ve seen are not cute. They’re hideously skinny and either near anorexic or anorexic. Makes me sick, ironically. I never like fashion shows, I never see the pieces in the same way shown as the average person on the street wears the trend. What was old is new again – I have worn alot of this ripped up post apocalyptic stuff back in the late ’70’s early ’80’s. Rock on! I’m sure that its very likely that they aren’t anorexic, give them a break…Just because they are probably naturally skinny doesn’t make them horrible people. And about the fact that its not wearable doesn’t totally matter. A designer should be able to present their concept when they have their show, and it is up to the stores and people that buy the products to take it apart as they wish. 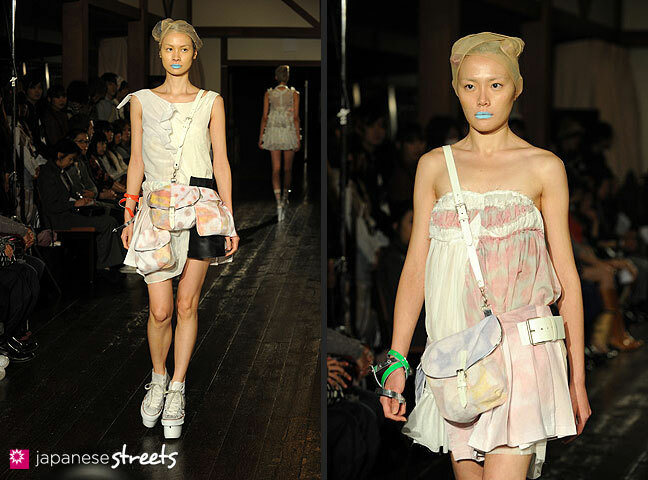 But I do agree, these are all basically unwearable if they were in the streets just like this, I think even in Tokyo. I like the color pallette and I think some of the pieces could be worn (as separates of course) like the halter top, some shirts and a few bottoms. 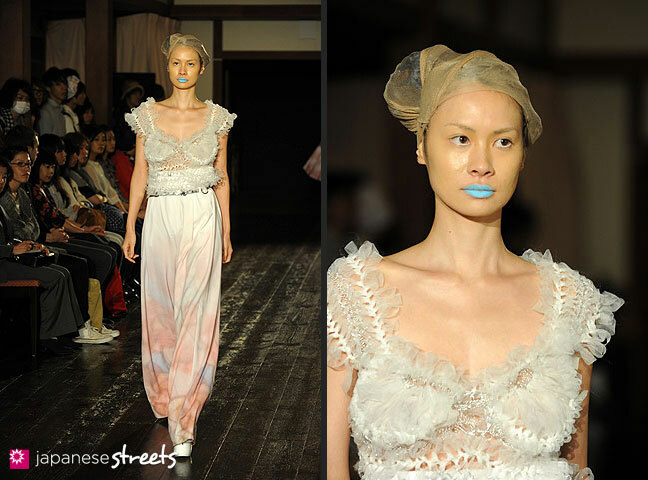 I think half of the models looking “strange” is because of the bright blue lipstick. It looks cool and very arty but is extremely distracting at the same time which probably isn’t the best choice if you want people to look at the clothes…Overall even though these clothes may not be practical it was still fun to see these photos and get some inspiration, thanks Kjeld!!! @Sierra: Thank YOU, Sierra. I have some trouble with the blue lipstick, too. Otherwise I really liked the show. @Lactose Intoler-Art: Totally agree with you on the models. I used to be quite skinny myself (65 kg at 186 cm / 143 lbs at 6.1 ft) and for years was unable to gain much weight no matter what I ate. 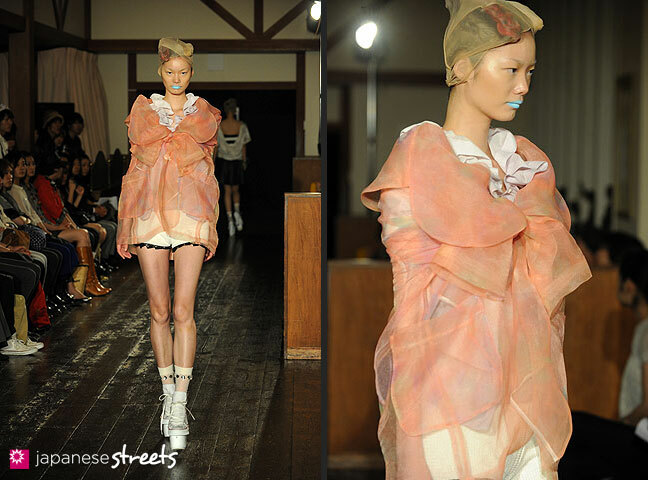 @Mel: As Lactose Intoler-Art and Sierra also mentioned, the idea of a fashion show is to display an artistic concept. This may inspire new directions in fashion and art, while parts or individual pieces can be worn as is. But some of these pieces will surely also be seen at parties or club events. And quite a few don’t look that outlandish anymore when you think away the make-up, hair, the setting and imagine them being worn by someone you know. For example, the black skirt. That would look good anywhere, and I wouldn’t at all be surprised if I saw someone wearing it on the street even in my local town. Continued from above: What I like about fashion shows is that designers allow you to look beyond what is accepted as normal, the so-called standard. It is like traveling abroad. You discover that values and ways of doing things that you considered a matter of course, or common sense, are not so all. Everything in human society was arbitrarily decided by someone at some time, and nothing is set in stone. To me watching a fashion show is like visiting a culture I am unfamiliar with. I learn new things and start to understand my own culture and myself better. The designer is my travel guide. I disagree wholeheartedly with anyone who says these clothes are “unwearable”. with conviction i had chosen about 7 pieces that i had taken a liking to and decided could serve my wardrobe justice. further more, i thought the reasoning of a fashion show was, for the viewer, attempting to break down the designers statement and to appreciate the individuality and detailing of each and every piece. 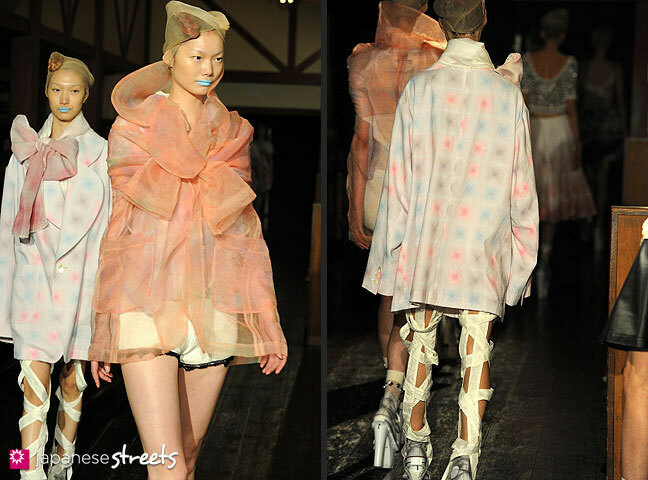 It’s ridiculous when someone looks at runway and says that the clothes could never be worn on the streets. 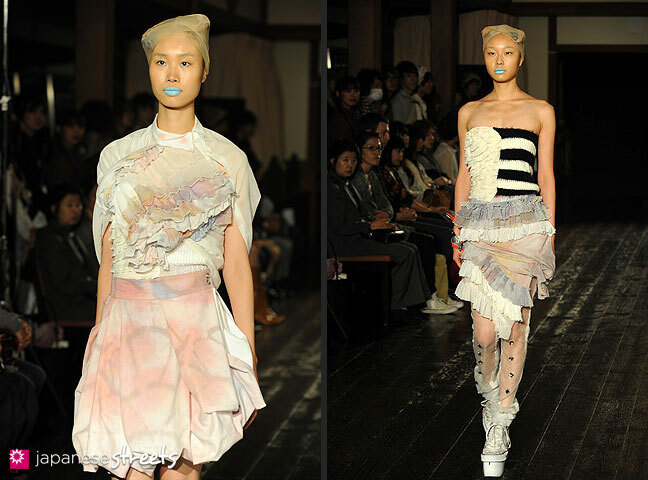 It’s true if you live in a small, under-cultured, fashion-challenged town, but I wouldn’t be surprised to see a woman dressed head to toe in these outfits in Harajuku or Paris during Fashion Week. Of course these pieces aren’t practical; they aren’t supposed to be. The designer isn’t asking you to where their clothes while you’re running for groceries or going to yoga or having coffee over at Starbucks. That would be an absolute unnecessary waste. Clothes like these should be worn at lavish parties, interesting club events, photoshoots and fashion shows. There’s a time and a place, and if you can’t tell when something should be worn, you shouldn’t bother voicing an opinion that has no spine. Fashion wasn’t just created for you, Mel. @9891rjv: no offense to Mel but I agree these clothes are amazing and if I owned them I would wear them to the grocery store or out for coffee. I don’t care what people think if I like it I will wear it somewhere. I would make up an excuse. The problem with art and fashion is that it is highly opinionated. I agree with the people who say that some of these clothes worn separately would look amazing. A lot of it is actually kind of classical mixed with odd color/pattern style. I for one, really like the cross-body bags some of the models are carrying. This series of photos reminds me of a dreamy tie-dye cotton candy party (that might partly be due to the blue lipstick, though..you are all right it is distracting!). Anyway, great photos! @code_name_kohaku: “The problem with art and fashion is that it is highly opinionated.” True, that’s what makes the discussion so incredibly interesting. You get to hear viewpoints that you may not have considered at all yourself. I really enjoyed the conversation on this page. Thanks to all who participated!